To be or not to be a musician....do you even have a choice? Perhaps not, if you have that love, that commitment, that...insanity! Even if destiny leads you to music, you can choose your teacher, and you can choose your college program. But how do you decide? Recently I chatted with University of California at Los Angeles (UCLA) adjunct violin professor Lorenz Gamma, who brings the perspective not only of a violin teacher, but also of a violinist with a wide range of experience as a performer and as a scholar. Gamma, 34, lives in Los Angeles and is originally from Switzerland. Question: What should an undergraduate violin major be seeking from his or her college education? Answer: I think the teacher of an undergraduate student has a tremendous responsibility, because a student, after his fourth year of undergrad, is considered a professional musician, which he isn't before. To audition for a major orchestra, for example, you need to have a degree of some sort. As a professional musician, certain things are expected of you. You should have no major problems, such as intonation problems and postural problems. You should have a personal sound rather than being a slave to the instrument. You should be well on your way to coming to terms with who you are as a musician, as an artist and as a violinist. That doesn't mean you're not a work in progress. In fact, probably you are a work in progress until you die. But in those four years of doing an undergrad, you have to get a pretty good idea of those big issues. Q: What happens ideally during those four years, to bring a student up to that level? A: The average high school student might come to an undergrad with certain deficiencies in one or the other areas. He might not have ever done any etudes; he might have only practiced the Bruch concerto for three years before coming to school. So the first year or two in an undergrad, I use to fill gaps, often of a general, technical nature. Tricks like spiccato, double stops, and working on vibrato and fluid right and left hands. But the idea is to have a well-balanced meal in your lessons. You need your protein, you need your vitamins, you need your fat, too. You need everything. And I think you need etudes, you need concertos, you need your Bach, you need a showpiece every once in a while, to become a well-rounded musician. You need chamber music, you need orchestral training. The reason being, that most musicians will likely end up doing a combination of things for a living. For example, I might now become mainly a teacher, but in the past I've been playing in orchestras, in the section and as a leader, I've started to teach at a fine university, I've been playing chamber music, I've been playing in the studios, I've been playing recitals, I've been playing concertos... so I've done a wide range of things. If I detect in a student that he will become a soloist, I would concentrate, obviously, on that type of repertoire. If I see that a student comes in with a clear talent for becoming the first violinist in a quartet, having that verve, and that charisma that a first violinist in a quartet needs, and that incredible passion for chamber music, I will concentrate with him on that, too. And if somebody comes in who says, 'I want to become a member of a major orchestra, that's my goal, can you get me there in four years,' we'll work on that. But most people don't have such clear ideas when they start an undergraduate degree. In those cases where a student's idea of what they want to be one day coincides with their talent to become that, that is when we go for that. Other than that, with 85 percent of everybody else, a well-rounded instruction is the way to go. Q: How does a violinist plan his or her career path, or figure out what area of music to specialize in? A: You can't know these things when you are 18. I sure didn't know when I was 18. I didn't know when I was 20, nor when I was 25, nor 30, Now I'm 34 and my life is sort of going in a certain direction. But I've been floating from job to job, too. Actually it's not a bad thing. It's all part of who I became. I wouldn't want to miss all those experiences. Having played a few Verdi operas, that doesn't only mean that I know how to play Verdi operas. It also means I've been inspired many times by great singers, which will change the way I play the melody in the slow movement of a Beethoven sonata: For example, if you know what bel canto is, it will affect everything else you play. So you can't really know. Some people will never become a soloist but they sometimes have this unrealistic hope. That's not such a great thing. It's funny how often there is a discrepancy between what people think they will become one day and what really is the case. Sometimes people are also too modest, they think they will be very happy being a section member in Atlanta, and before you know it they are a principal in the Philadelphia Orchestra. Q: Besides learning the obvious repertoire, what do you like your students to study to improve their overall violin playing? A: I do believe in the study of etudes. I consider etudes as a sure way to acquire useful violinistic vocabulary. Etudes are designed in ways where they treat one problem at a time. You have an etude for spiccato, for thirds, for Cantilena style, for fast fingers, for trills, it doesn't matter, all these things are violinistic problems, and you take care of them one problem at a time by using well-chosen etudes. Also, a lot of these etudes were written by people of the Franco-Belgian School. They knew and understood the playing style that was founded by Viotti, the father of modern violin playing. They were his disciples or his students in Paris, and the line goes to Ysaye, Kreisler, Flesch and Galamian! All the virtues in violin playing, they appear somewhere in those etudes. It's like learning a language: You can understand everything in terms of grammar, but if you don't have the words as well, you will never speak it eloquently. And by just chopping away at these etudes, one a week, you can acquire a vocabulary: of motions, of sounds, of phrases and ideas, that you can then apply to your Beethoven sonata. Another reason I like etudes is because you learn technique away from the pieces, so for example, you don't have to study the Tchaikovsky concerto for two years. Q: How does one go about choosing a teacher? A: I think it's very important that the student and teacher audition each other. No teacher is made for every type of student. A trial lesson is a very good thing. Q: What should a student be looking for in an undergraduate music program? A: Often an undergrad doesn't know exactly what he or she needs. So what he should find out is, what actually a college degree is about. What does that school offer, or what does that violin teacher offer? Does the teacher do orchestral studies, does the teacher listen to excerpts? Is there chamber music? What is the orchestral situation? What is the situation in terms of master classes? Is there a weekly master class in the studio, where people play for each other? Q: What about the location of the school? A: This is something to consider. Big cities have a little bit of a disadvantage of being distracting. If you go study in Bloomington (Indiana), for example, you will practice all day because there is nothing else to do. In LA, that is a little harder. On the other hand, the big advantage of having a big city is we have a phenomenal orchestra here, with great concerts, and also soloists. To have that near is a wonderful thing. I would probably weigh the benefits of studying in a big city higher, in the end, than the disadvantages. Q: Does the size of the program matter? Some people worry about being "lost" at a big school. A: It's funny, we're afraid of big places, but big places have lots of people, and you may be more likely to find friends. If you are in a school that has only 50 students, you may not really click with any of those 49. In a school of 2,000 students, I'm sure you will come across some people that you get along with very well. I think UCLA is actually an ideal size. It's not the world's largest school, but it's not tiny, just about right. Q: Now that you are a college professor yourself, what is it that you are listening for when you audition a potential undergraduate student? A: I am much more interested in seeing somebody's passion for music and the violin then a cold, technically perfect performance. Because passion lasts longer. You know, we're each a machine, and after a while the oil gets dirty... There's never a guarantee we will play well. But as long as we are inspired, we have a good shot at inspiring an audience, too, and that is what it is ultimately about. If somebody shows that they are serious, and that they feel strongly about something, that's to me worth much more. Of course the musical parameters that we listen for, they have to be on a good level. Somebody who comes and auditions needs to show a general understanding of the music, to have musicality and to have a pretty good technique. But I think that the most important ingredient is that somebody feels strongly about what they do. Q: Tell me the one best thing you learned from each of your own teachers. And from Gunars Larsens, attention to the "correct" mechanics. Ralph Matson, he was in Salt Lake City, concertmaster of the Utah Symphony. From him I learned how to practice with a metronome, that everything is possible if you just take out your metronome, and take it one notch at a time. A simple but inspiring philosophy! 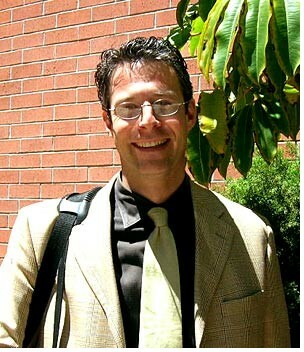 After that, I studied with Steven Staryk at the University of Washington. From him I learned how to take an audition; I learned to play excerpts. I won my first audition, and it was great. Now I like to teach excerpts myself, because I kind of know what it's about. There are unwritten rules in auditions, and they are just good to know: wrong accents, slides, tempo fluctuations, that sort of thing. I probably learned how to put everything together from Mark Kaplan, who at the time was at UCLA, and now is at Indiana University. From him I learned how to be a more complex thinker about music. He's somebody who can really make sense out of a Bartok Sonata, and not just play the notes reasonably well, but actually he knows the architecture and the true inside of a piece. The more complex, the more difficult, the more obscure, the more fun he has finding out what it's about. From him I learned that, even though sometimes you might think you have found your way to play a phrase, there are 500 other ways to play that phrase. Not only that, but you can reflect that in your playing, that knowledge that you could also play it in 500 other ways. You are just choosing this way in this moment. Tomorrow it might be different. In the end, that's the beauty in all great art: knowing that it is personal and emotional, and that it can be different each time. What a great post. Our young violinists will get so much out of this especially those thinking about majoring in music at the university level. As an adult amateur, it makes me slightly envious of violinists that get to hone their skills in college, but only just a little! Wow, this was quite interesting because I am thinking* of majoring in music. * I really want to...but do I have what it takes, would I be happy doing it, etc? It's a huge question, Sydney. And the answer depends also on your other interests in life. My grandmother once said something rather simple but wise: "Keep doing the things you like to do, and you will spend your life doing the things you like to do!" Wow Laurie. I just read your comment and I thought you said "it depends on your INTEREST in life." And I was thinking "Well, I'm not suicidal..." Haha. Anyway, that's good advice your grandma gave you. It's scary thinking what I do now can determine and/or ruin the rest of my life! Ahhh!